Expressions of interest are sought from community members to join the CSSK Sustainability Working Group. Steiner education and Rudolf Steiner inspired initiatives have been pioneering sustainable practices for over a century now. Recognizing that chemical manipulation of agriculture was neither desirable nor sustainable, Steiner helped launch the agricultural movement of Biodynamics, community-supported agriculture, and even lead to the development of green banking. Steiner reinvigorated the use of natural medicines, and recognised biodiversity as a means for sustaining a healthy planet. His writing exerted considerable influence on contemporary architecture. He challenged the prevailing modernist thought of the times that a building was but a “machine for living” helping inspire and develop more soul-full, organic and humane architecture. The group met on Tuesday 1st of August for the first time to discuss Terms of Reference and set priorities and focus of the group. Some of the initiatives already underway include adding our school in the ResourceSmart schools program and retrofitting the Craft classroom with appropriate insulation. The group discussed several areas of focus; waste management, energy usage, biodiversity, water usage, creating/retrofitting energy efficient buildings, education, and community engagement. 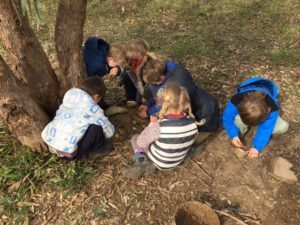 Castlemaine Steiner School & Kindergarten has always maintained a commitment to being a Sustainable School by reducing our ecological footprint through adopting sustainable practises in our everyday lives. CSSK currently integrates sustainability into all areas of the curriculum and instils a sense of ownership of and pride in improving the environment. The aim of the group is to make these practices more explicit and more clearly articulated within our school’s Strategic Plan. As many of you will be aware Lorna Atkinson retired at the end of last term. Lorna was employed under the Chaplaincy funding and served the school admirably over her tenure. This is an important role in the school, providing counselling and support for children and parents. As an interim strategy we have asked Mark MacDougall to fill this role in its current form till the end of term to provide an opportunity to review the position. Mark recently conducted the Restorative Practice workshop for the staff at the beginning of this term. This was well received by all and part of his role this term will be to embed the culture of Restorative Practice into the school. Mark comes with a great deal of relevant experience working in schools as a group work facilitator in Pastoral Care programs and as a Primary Welfare officer in local schools. He is also a parent in our school and is well known in our community. We will be formulating a referral system for anyone wishing to speak with Mark and we will inform you about this shortly. Mark will be at our next assembly on Monday if you would like to say hello and he will commence work on Tuesday. Thank you to all who attended the two meetings last week. There was a very positive feeling amongst parents in response to the school outlining plans to continue the current format for class 7/8 in 2018. Currently, the two teachers in classes 7 and 8, Rob Jorritsma and Anne Perry, take Main lessons in both classes, providing different skill sets and passion for particular subjects. The two classes come together for some lessons, particularly LOTE, craft and PE. The students have found this to be a rewarding experience this year and it is a model the teachers feel can be adopted in following years. Reporting day was well attended this year which is a testament to the level of care and commitment parents have for their children’s education. We hope your meetings were fruitful and that you have a clear picture of how your child is travelling. The end of year reports will be different to the mid-year reports, being more comprehensive. We are discussing the format this term as we have the possibility of using the new School operating system, Engage to assist in creating reports. There will be more commentary in the end of year reports as we are aware ticked boxes are much less personal and only give a picture of performance instead of the bigger picture of your child as a person. Annual School Concert – Thursday 17th of August at 7pm. All are welcome to this fantastic opportunity to see our budding maestros! 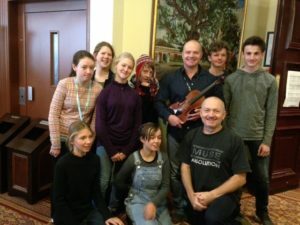 Eight of our class eight students attended this years Orchestra Victoria workshop held in the first week of this term in Bendigo along with six of our past students, It was wonderful to see our school so well represented. They played their hearts out for three days,working with the professionals, finishing with a tremendous hour long concert of the works studied ranging from Hadyn to Grieg to themes from the James Bond movies. On a personal note I am so proud of the effort and enthusiasm displayed by Tully, Sascha, Beatrix, Ezra, Rilke, Alex, Lucy and Ella and in return I’m sure much was gained. Please refer to the classifieds for Music Camp information. We are using the last of our tomatoes (which have been gradually turning from green to red)and have harvested olives so the seasons are really turning. Class four will be processing the olives and a number of them are already experts so they should be pretty good! Weeds are jumping out of the ground and the children have been having fun thinking about broom (so pretty..) and why we need to pull it out (they are spreading at a fast rate of knots and besides pulling them out is so much fun!). and shoes of radiant light. Jack Frost has been visiting our garden at playgroup and freezing all our spade and bucket handles. All our fruit trees are bare and the water coming out our tap is stone cold. The children have been making pease porridge in the sandpit and grey leaf toasties with sand fillings! 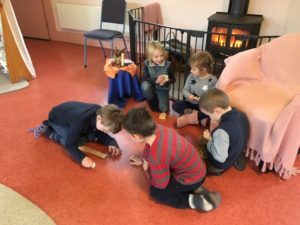 We are little gnomes cutting and stacking firewood in morning circle and the parents are slowly creating with their knitted squares ewes and baby lambs. We have noticed our first daffodil open this week and the Winter Golden Fairies are opening up all the wattle flowers around us. Please remember your warm hats and fruit next week everyone. We have had a lovely start to Term 3, the children returned full of enthusiasm for catching up, playing, baking and generally being together. I hope you are all enjoying the first glimmers of Spring in the garden. Although we still have cold mornings and nights, I have a feeling that the weather is turning and Lady Spring will be on her way shortly. hacking and cracking the rocks and the stones. 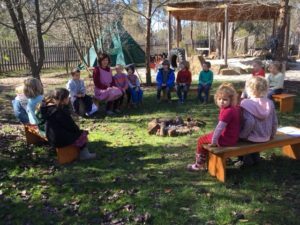 The children have been enjoying our weekly walks to play across the creek and collect kindling. This week we also had a camp fire and cooked toast. Thank you to parents for attending our parent teacher meetings last Friday. I find these very valuable. The frosty morns, with sunny skies, allowing the daffodils to smile at us and letting us know that though the depths of Winter still appear to be with us, Spring is knocking on the door, as is our Greek Mythology Main Lesson. We are still also practicing with Jose for the Olympic Games first thing Wednesday mornings, so appropriate clothing and footwear are essential. A class newsletter has gone home this week. Please enquire if you have not received it. Thank you to parents who attended last weeks Class Meeting to consider information about what is to be offered in Classes 7 and 8 next year and then coming along to the Parent Teacher interviews to cap off a week of important communications about your child’s progress and plans for the near future. Class 6 continue their Introduction to Physics. Demonstrations and experiments this week have involved an experience of darkness, Light , shadows and Colour after images. Sometimes the feeling of wonder is evoked in the students as they experience seeing sound made visible by the Chladni Plate sound, the way light is blocked by forms to create shadows and the characteristics of colour that live between the black and white. Just as the science experiments are subject to certain conditions so too are lives influenced by the presence or absence of certain conditions. Students are exploring, through creative writing, the effects on characters when conditions change unexpectedly. The class enjoyed playing music together with Class 5 during this weeks ensemble. Some students from both classes have been playing soccer together at lunchtime whilst other have been sharing reviews and comparing reactions to a range of books at the Tuesday Lunchtime Book Club. It is good to hear most students are putting time and effort into instrument practice in preparation for the rehearsals for the School Concert. We had our first Growing Abundance school lunch two weeks ago. There were some teething problems with ordering and delivery, but the food was lovely and well received. We have also asked Growing Abundance to make it clearer on the website whether items are available dairy free or gluten free. We have started preparations for this year’s Spring Fair. A group of parents have formed a working group to coordinate. We are meeting on Wednesday mornings in the Parents Room. All are welcome to come along if you’d like to contribute. We are looking to simplify the Fair a little, with an emphasis on experiences and engagement. We are also giving consideration to moving the Fair to the Sunday after Melbourne Cup. We think a Sunday will be a more relaxed day with fewer work and sporting commitments. Lots of little jobs are underway. Playgroup parents are covering matchboxes with felt, turning them into the beginnings of beautiful treasure boxes. Sujeeva is coordinating the food again this year and Natalie and Aleesha are taking on the Craft Stall. We are looking for a coordinator for the tea, cakes and chai at Cafe Ensemble. Hello all and a belated welcome back to term 3. This term is exciting and jam packed, with all children completing their current projects and beginning a new one. Class eight exploring the Revolutions of the world and beginning to work with Sewing Machines, relating to the Main Lesson, The Industrial Revolution. A huge thank you to the class one parents who were able to come in and help with the teaching of knitting, it is a challenging skill to learn and I am so grateful to have the parents supporting me at present. The wooden display cabinet in the foyer is presently displaying the class sixâ€™s first woodwork project, a wooden egg on plinth, please come in and have a look. These pieces were carved from apple tree wood. Parents of class six could you please remind your child to bring their eggs to school, if they havenâ€™t already, so they also can be displayed. Any late arrivals need to report to the office for a Late slip before going to the classroom. Absences can be reported via text to 0407 124 508 with child’s name and reason for absence. Localizing Leanganook has the pleasure of hosting an inspirational speaker from Queensland, Dr Michelle Maloney, National Convener of the Australian Earth Laws Alliance (AELA). Michelle is co-founder of AELA and one of the driving forces behind this paradigm shifting initiative. Michelle will introduce us to Earth jurisprudence, or â€˜Earth laws, which calls for us to shift the underpinning structures of industrial society to nurture, not destroy, the natural world. Michelle will discuss how Earth laws offer a grounding for new forms of social and ecological governance, economy and community. Michelle will discuss a range of practical projects that enable communities to engage with Earth centred laws, governance and ethics, including: The Green Prints project, the New Economy Network Australia, the Australian Centre for the Rights of Nature, AELA Education, Earth Arts and other projects. There will be opportunities for questions and discussion after Michelle’s presentation.